The global green bond market continues to boom, and Australia should position itself for that growth, Climate Bonds’ Head of Global Trends, Ms Bridget Boulle, informed a finance sector and investor audience at Climate Bonds Initiative’s flagship report; ‘Bonds and Climate Change State of the Market 2018', southern hemisphere launch at the Sydney offices of King & Wood Mallesons, yesterday, 31st October. Our annual analysis of the labelled green bond and wider ‘climate-aligned’ bond universe this year identified over USD1.45 trillion of potential green bonds, reflecting the market has huge headroom for growth into the 2020s. “Australia has a well-developed and diverse labelled green bond market, led by the major banks. 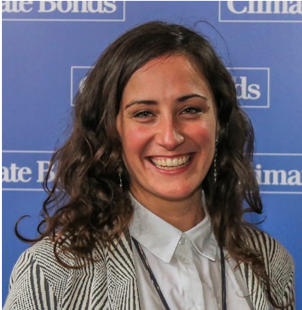 At the same time, there is significant potential for ASX-listed corporates to move from plain vanilla or ‘climate-aligned’ bonds to offering labelled green bonds to investors,” Ms Boulle commented in prepared remarks. 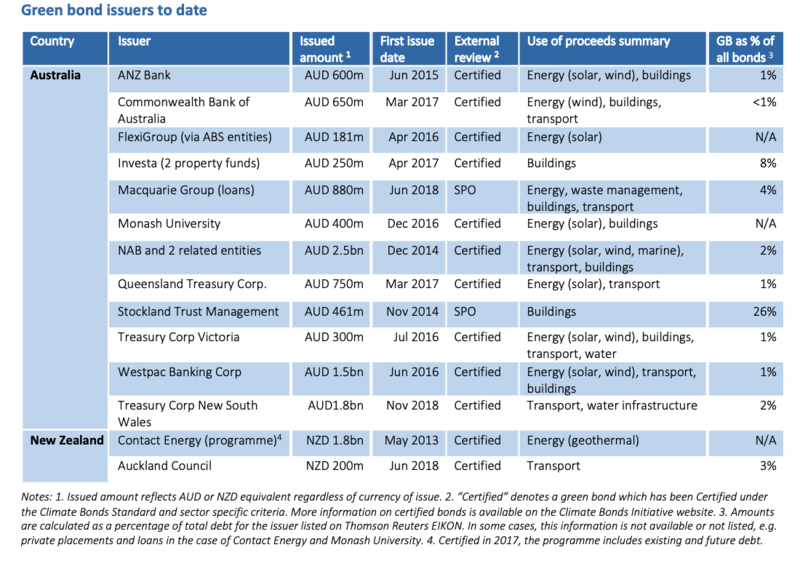 The comments are reinforced by Climate Bonds’ analysis of the green bonds issued in Australia since 2014 to June 30th 2018. Green issuance is dominated by the major banks, Monash University (a multiple issuer) and state treasuries, with Flexi-Group and Investa as recent leaders amongst corporates. In her remarks Ms Boulle said Australia should be positioning to grow local green markets and green finance expertise and capitalise on offshore trends, pointing to both green finance developments in ASEAN nations, the TCFD process, Climate Action 100+ and the recently launched Investor Agenda, all combining to drive investor demand towards green and low carbon products. The comments come against a backdrop of continuing warnings from Australian regulators that listed companies and their boards are yet to respond adequately to climate risks and accelerate their brown-to-green transition. Nonetheless at Climate Bonds we remain upbeat at prospects for Australia. The Green Infrastructure List from our Aus and NZ Infrastructure Investment Opportunities (GIIO) report identified over 400 projects and assets (360 in Australia and 62 in New Zealand) that can be considered ‘green’ and qualify for refinancing, additional financing, or new financing, in the near and medium future. Not all these projects will get off the ground. However, the Green Infrastructure List is the first of its kind, a comprehensive pipeline of low carbon and climate resilient infrastructure projects encompassing emissions outcomes, climate resilience and adaptation. The full 400 project list is here. Blessed with a multi trillion dollar savings pool, global scale pension funds and some of the world's biggest specialist infrastructure managers, Australia either will invest in low carbon infrastructure to meet its Paris commitments, with an eye to the coming ratchet of a 1.5 degree target and export both capital and green finance expertise into Asia or will remain in the slow lane of climate transition, with an economy and civil society increasingly exposed to various climate impacts. The State of the Market 2018 report demonstrates that green finance markets are gaining momentum. The sharpest eyed amongst local investors will be noting the moves from Hong Kong to ASEAN to India to around green based investment that supports low carbon growth and the opportunities that may open up for institutional investors able to take long term positions, particualry in infrastructure or alternative investments. “The release in Australia of The State of the Market 2018 report and our recent Australia & NZ Green Infrastructure Investment Opportunities (GIIO) report and Australia & NZ Green Finance country briefing, provide domestic investors and issuers, the superannuation & funds management sector and the big infrastructure managers a contemporary snapshot of global and local green finance trends to help guide their investment directions and the development of a robust green finance capability." P.S. Climate Bonds Initiative would like to thank King & Wood Mallesons (KWM) for their support and assistance in the Australian launch of the Bonds & Climate Change – The State of the Market 2018.